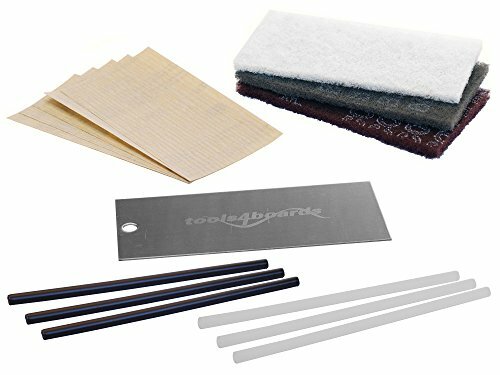 Fix gouges and scrapes with this complete ski and snowboard base repair kit. It contains everything you'll need: 3 pcs of Combi fibertex/scotchbrite pads: Maroon - medium, Grey - fine and white - extra fine to use in progression to remove micro-hairs and surface oxidation 5 pcs of structure premium sand paper, used to scuff damaged areas prior to ptex application and to re-establish linear base structure pattern after ptex repair 3 Black and 3 clear ptex Candles (8mm x 20cm) Black for Black bases and clear for white or colored bases stainless steel scraper, use as a drip plate for ptex and to gently plane excess ptex from base detailed DIY instructions. If you have any questions about this product by Tools4Boards, contact us by completing and submitting the form below. If you are looking for a specif part number, please include it with your message. Mini Ski Rack, Wall-Mounted, Steel Material, Black Color, Practical And Handy, Ski And Snowboard Rack, Highly Durable And Sturdy Construction, Convenient Storage, Ideal For Any Room, Garage & E-Book.